It's our New Year Sale! 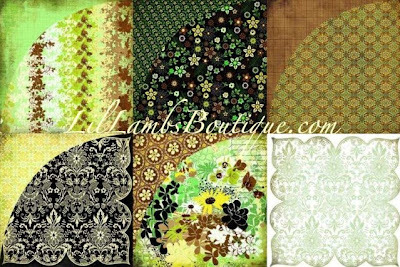 Happy New Year from all of us at Lil' Lambs Boutique! Nature's Storybook is my favorite of Webster's Pages fall releases. 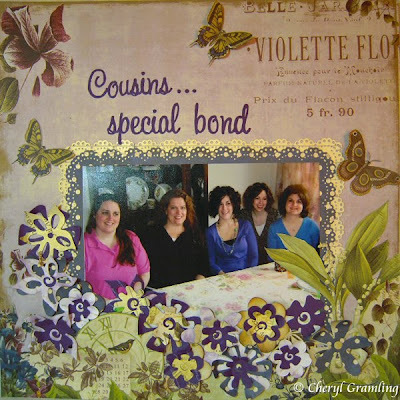 The rich colors in this collection are fabulous, from creams to violets to navy blues. The pallette is perfect for this picture of myself and my four cousins. It's not often that you are blessed with being very close to your family growing up and becoming wonderful friends as adults. I had to capture this "special bond" in our family. 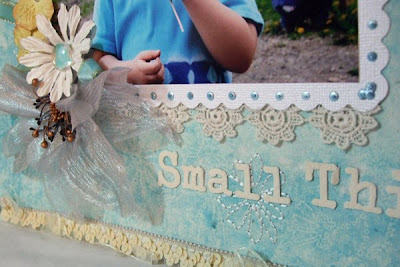 I used the Martha Stewart doily punch to create a double layered photo mat. I have a suspicion that we might be seeing some more Martha Stewart punches, in the Shoppe's future. The patterned papers are rich with items to use as die cuts. 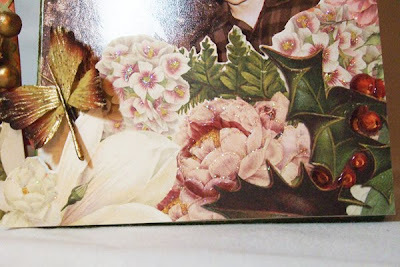 I cut out several butterflies, bent up the wings and glued down for a dimensional embellishment. I grabbed several of the patterns and die cut a bunch of flowers adding some solid color flowers as well. As you can see, I didn't have any problem die cutting right through words or lines. It adds character to your flowers. Once again Webster's Pages never fails to impress me. That's kind of the feeling I got when I opened the boxes from Basic Grey! They have two new lines out and they are both in stock and flying out the door! 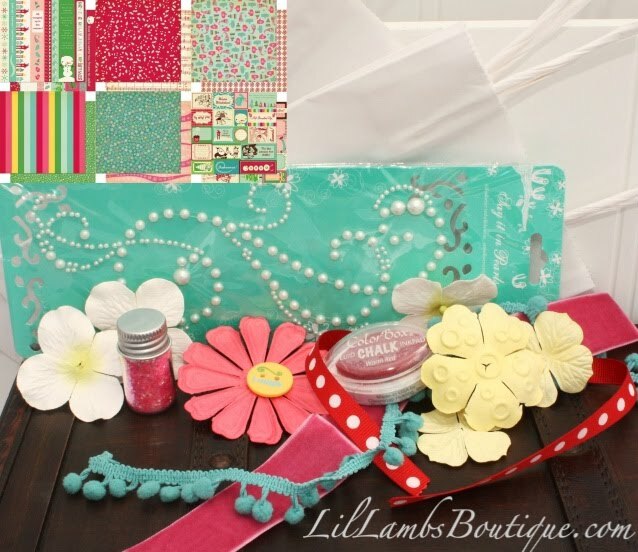 Check out this exclusive class kit featuring Sugar Rush... it includes tons of new Sugar Rush embellishments, instructions for the layout and even more instructions to make more cards from the leftovers... what a deal! 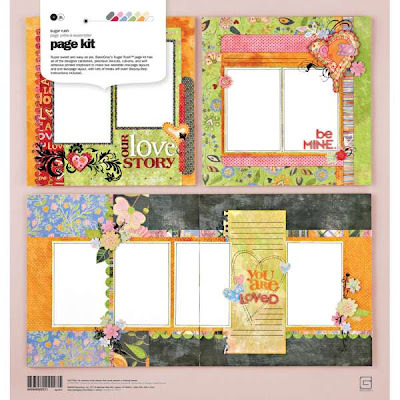 They've also introduced page kits which are prepackaged and will make four pages! We've got the tabbed mini album class kit too! 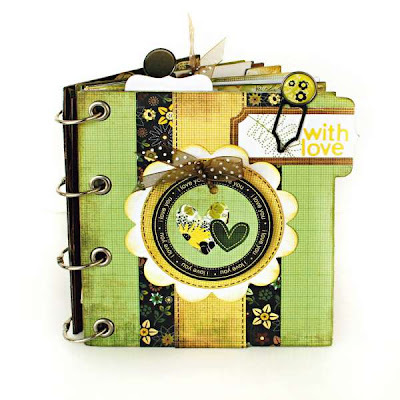 These are 6x6 and include everything to make this adorable album featuring the Origins line. And as always we've got the paper kit for you too. 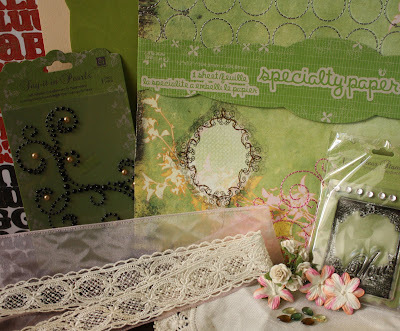 This kit also includes the very sought after Doily Lace decorative paper! BasicGrey will be announcing all of the details for the 2010 Page of the Month program soon. So far, all we know is that it will run from February 2010 to March 2011 and will be including more embellishments and more new items in each kit than last year. For those of you that would like to be on the preorder list for the POTM program, email me ASAP and let me know. The preorder list is filling up fast and these are always great kits! 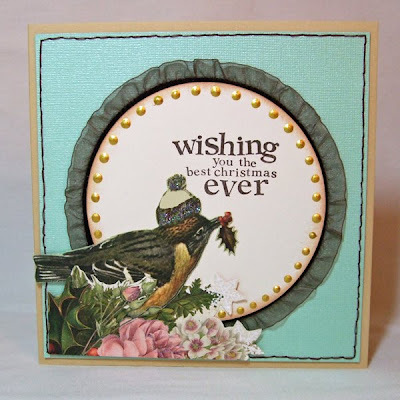 I absolutely love Prima's specialty stitched papers...the detail is so intricate and fun. Just check out the decorative edge trim on this paper! Prima made me smile again! Prima page in a flash! My valuable scrapping time seems to be less and less these days so I'm loving these stitched pages by Prima. Half of the work is already done for you- just find a kit to match your picture and you're done. Okay, so that might be exaggerating a little but it is much better than trying to thread a sewing machine myself! Check out this spectacular kit! I just cut out the center square, placed the picture behind and then embellished to my liking! I adore the bejeweled leaf in the kit! For the letters I took some of my clear acrylic letters and coated them with Tim Holtz's Rock Candy crackle paint and then accented the title mat with Rock Candy Stickles. Brrrr.... almost feels like ice! How fitting that it's a Prima declared week here at Lil' Lambs Boutique. I just happened to finish up this Blue Stitched Prima Deluxe kit this week. I love the stitched background pages because it means less work for me. 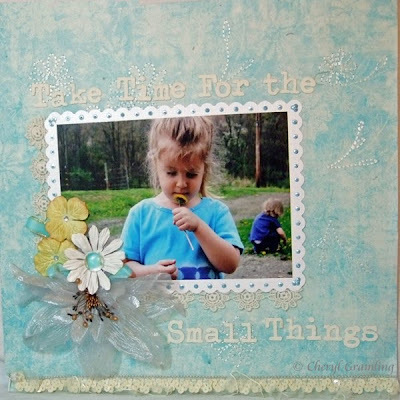 This Prima kit was a perfect choice for this picture of my daughter with her beloved Dandelion (I know, I don't get it either). 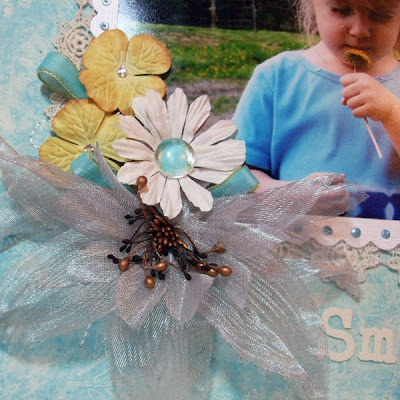 The yellow flowers in the kit were the perfect pop of color for the rest of the page. I haven't mentioned this yet but I really enjoy the Alpha Stickers. They come in quite handy when you want to have a longer title that you don't really want to cut out. Instead of the usual Stickles centers I put on most flowers, I decided to snip a bit of the blue velvet trim and stick it under the clear pebble...wha-la, instant blue center. I also folded down a third of the platinum flower to create a smaller corner border for my photograph. Here's a closer picture of that gorgeous lace trim. It always reminds me of the tablecloths my Great Grandmother had and we kids were never allowed to eat on. Don't forget to take time for the small things this Christmas season! I've declared this week...Prima week! I love playing with the cardboard and the printed design reminded me of the gorgeous blues of the ocean and the coral you find there--- so that is what it became. If you haven't taken a look at the Winter Wings Deluxe Kit, well you should. 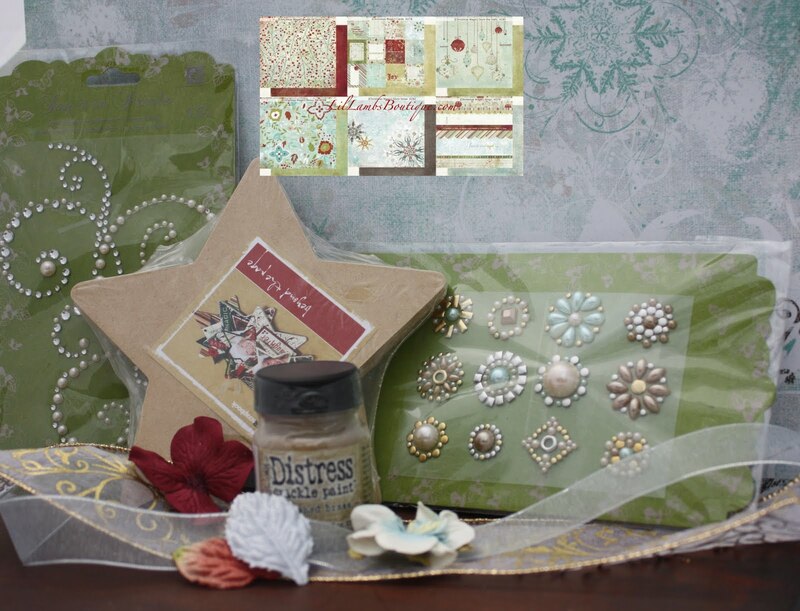 This kit is packed chock full of Christmas goodies. Below, I have 3 different types of projects I created. First up, I used the Bay Window MDF that ws included and created this Christmas gift. 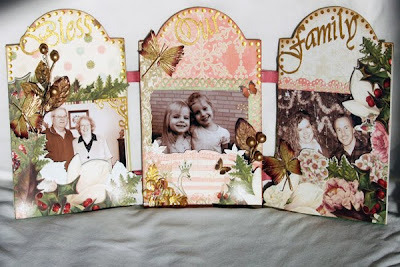 The Winter Wings paper have so many great border elements that can be cut down to size to fit the edges of the panels. 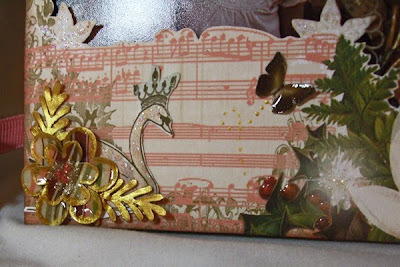 If you'll notice, I cut apart the gold flutter vine and added parts to each panel and used some of the leftover on my Christmas tag below. Once you finish your Bay Window project, there are still plenty of leftovers to create some other things. 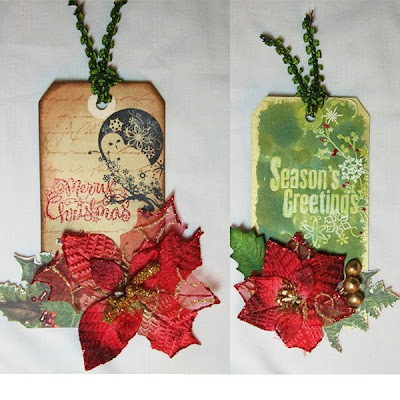 I chose to use more of the fabulous patterns on the paper, the beautiful trim and flowers to create a card to go with the gift and a couple of Christmas tags. Hurry, you still have some time left to get some Christmas gifts made. 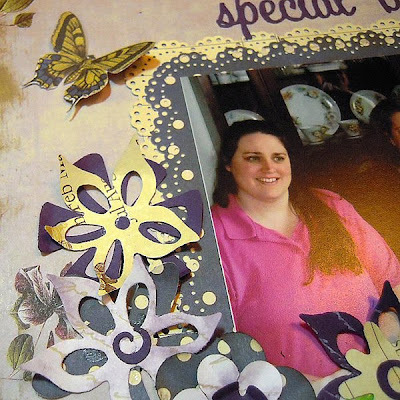 So get busy and get crafty, making all of those beautiful gifts for the special people in your life. 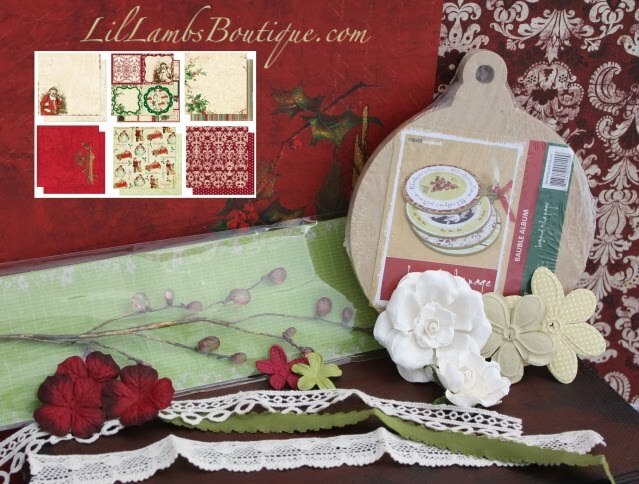 We still have lots of Christmas kits available to make your gift giving a breeze! This kit with gorgeous Fancy Pants Designs paper includes a Kaisercraft album that would make a beautiful gift or you can even split up the album and make ornaments! 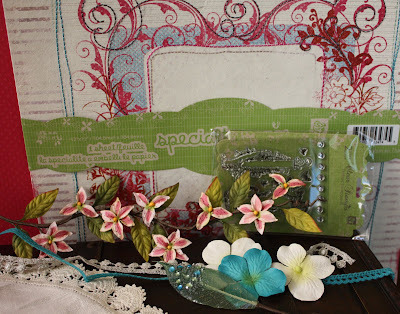 Cheryl will be sharing her creation with this Webster's Pages kit soon. You won't want to miss it- check back soon! BoBunny released two Christmas lines this year. Both are fabulous and fun! So you want something besides red and green with a more festive feel? 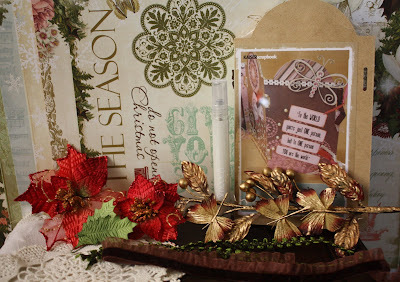 Cosmo Crickets "Jolly by Golly" kit is for just for you! And I adore Little Yellow Bicycles new album kits... put away your craft knife... they've made it so simple with paper that is pre cut to perfectly match the shaped album. Everything coordinates so that you will have this album finished in a flash but it will look like you've worked for weeks on it! Now, let's say goodbye to fall and start decking the halls. Tracey (PictureJunkie)and MonaLisa email me and I'll send you your prizes!